It’s rainy, it’s cold and it’s dark, what better way to spend the evening than watching a fun family movie together! We were recently sent the newly released Tooned 50 on DVD to review. From the creators of the award-winning cartoon show TOONED comes a fast paced and fun story of McLaren’s 50 years in Formula One! We hadn’t seen the Tooned cartoons so were excited to watch the DVD. The story is easy to follow with Professor M and McLaren’s old mechanic battling it out to tell the ‘true’ story of McLaren’s 50 years in Formula One. Starring Brian Cox as The Old Mechanic, Alexander Armstrong as Professor M and with the voices of Formula One legends; Alain Prost, Mika Häkkinen, Emerson Fittipaldi, Jenson Button, Sergio Perez, Murray Walker, Tom Hunt as James Hunt and Bruno Senna as Ayrton Senna. We found the DVD to be fun and entertaining, it kept Maxx’s attention with the fun facts. The great thing about Tooned 50 is the fact that it can be enjoyed by both children and adults. The story line is fun and engaging with plenty to keep both children and adults entertained and laughing along. If you like the sound of Tooned 50 make sure you enter our competition where you could win one of three copies, you can enter here. 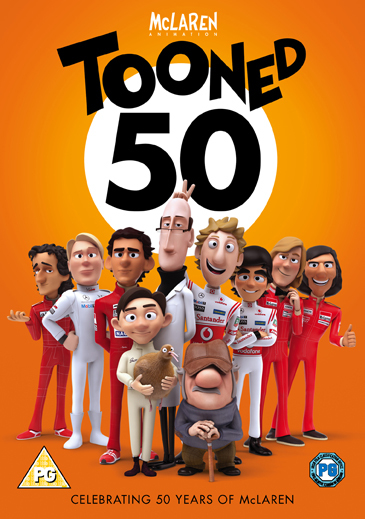 Tooned 50 would make a fantastic stocking filler or gift for little or big F1 fans this Christmas!